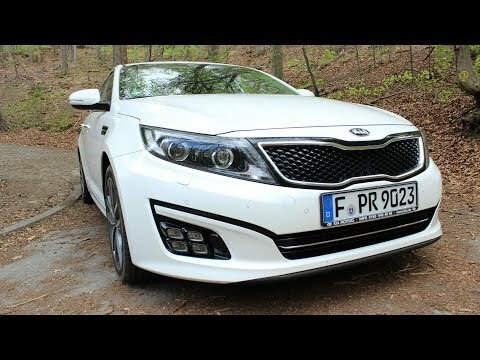 The 2014 Kia Optima offers those attributes most desired by consumers - such as good fuel economy, performance, comfort and technology - and wraps them all in a package better looking than some luxury cars costing twice as much. To top it off, Kia backs the Optima with a standard 10-year/100,000-mile powertrain warranty. Do not judge a foreign car but it name, it could be a diamond in the ruff. My 2014 Kia is really good on gas. It has all the goodies sun roof, moon roof, Cruz control, a/c, electric mirrors, electric seats with warmers both front and back. It has controls in the steering wheel for the Bluetooth with smartphone capability and a sound system that a am-FM CD player that lets you feel the music along with hearing it. ( mood sitter )you catch the right corner with the right song you'll be very surprised to find it is very fast from a dead stop. It handles really good at higher speeds but does not have a tight turning radius, as in doing a U-turn. Only low point for me is how low you sit, because I 'am very tall it make it hard to get in and out of the car. Very reliable and no major issues. Had my car for roughly 6 months. We have had no problems with it so far. Performance and reliability has been excellent. It is comfortable to ride in, but does sit lower to the ground so it is a little harder to get in and out of. We have 3 kids (all in car seats) and we have just enough room for all of them to fit. Some of the features include - heated/cooler seats (front and rear, ) heated steering wheel, sunroof, Bluetooth stereo, Sirius xm, and keyless entry. It is a great car but wish we had something a little bigger because we are a family of 5, and have a dog. All of the good with very little bad. I feel the car performs rather well. I like how quick the speed picks up. I enjoy the rear, reversing camera. I think the breaks seem to go quickly, but that could be due to variables outside of the car, like myself. I find it rather comfortable. I do find it odd that the passenger seat is not power like the driver's seat. The back seat is spacious, as is the trunk. It is easy to perform basic maintenance on the car versus taking it to a shop for something minor like changing a lightbulb. The car is very user friendly.